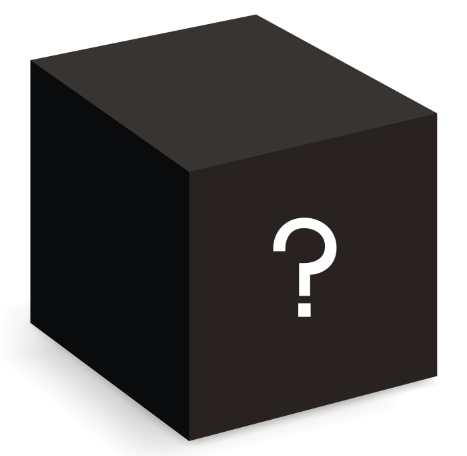 A black box with question mark, a certain “fear of the unknown,” July 9, 2016. (http://socialcapitalmarkets.net). The phrases “fear of the unknown” or “fear of the other” has been something that I’ve been familiar with as long as I’ve been in the classroom. So many essays, so many discussions, so many presentations where these stock phrases have greeted me in my capacity as instructor, professor, facilitator, administrator, and public speaker. Ultimately, the use of these all-too-often used phrases reflects the inability of the people who speak and write them to see other people as Homo sapiens, thus diminishing their humanity in the process. The first time I seriously encountered either phrase, though, was in my second semester of teaching History of American Education in the College of Education at Duquesne University for MAT students. It was the fall of 1998, and I was teaching a required education foundations course (I was also doing Multicultural Education that semester). To be sure, there were a couple of veteran teachers who didn’t like having a twenty-eight year-old Black man telling them about the marbled history of their profession and the institutions for which they served as K-12 teachers. Some of their bigoted evaluation responses disclosed as much. 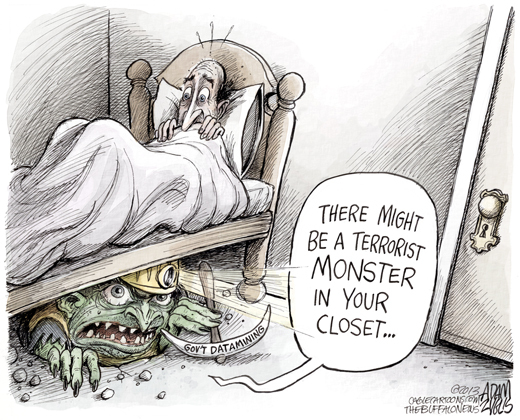 Data Mining/Fear of the Unknown cartoon, Adam Zyglis, Buffalo News, July 6, 2013. (http://adamzyglis.buffalonews.com/2013/07/06/data-mining/). The student didn’t really answer my question, as if “fear of the unknown” needed no explanation. But on the paper related to the experiences of the children of Southern and Eastern European immigrants, Black migrants, and working-class women, over and over again, the phrase “fear of the unknown” kept showing up. What made this use of phrase even more disappointing was an even more sobering Western Pennsylvanian reality. 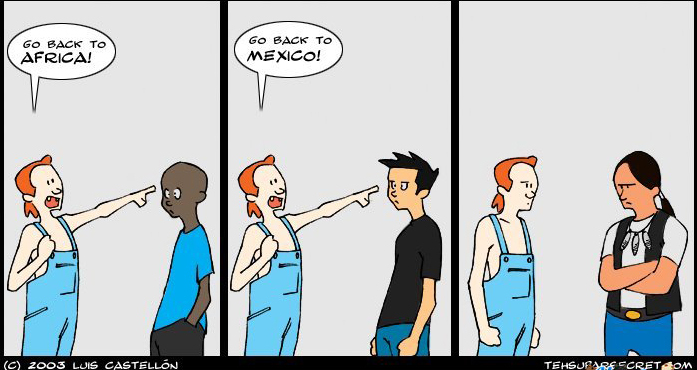 Most of my students were the descendants of Southern and Eastern European immigrants, some of whom were old enough to have had contact with grandparents who must have recounted their experiences with xenophobia in public education. That these students couldn’t possibly see the inhumanity of the phrase “fear of the unknown” made me question whether these current and future teachers should be in a classroom at all. Luckily, I did manage to reach a few of my more skeptical students around these sorts of issues as this course progressed. After all, most teachers really do want to help their students. A couple even wrote me notes after slamming me in their evaluations about how my History of American Education course had opened their eyes to inequality and social reproduction in K-12 education. Since then, I have remained keenly aware of when students, colleagues, public speakers, and fellow administrators (specifically in the context of the nonprofit world) have said or written the “fear of the unknown” or “fear of others” phrases. Mostly, it’s not in the context of White ethnics from an era in which “White” mostly meant “White Anglo-Saxon Protestants.” Over the past fifteen years, I’ve seen and heard “fear of the unknown” in reference to Blacks, Latinos viewed only as free-loading immigrants, and Arab-Muslim Americans as US-hating terrorists. There have been students who have justified the race riots of the not-so-recent past (the ones where White mobs stormed into Black neighborhoods and burned them out while maiming and killing Black men, women, and children) with the phrase “fear of the unknown.” Or co-workers who’ve explained away their xenophobia or homophobia as a natural “fear of the other.” Or public speakers who’ve explained Islam as if it were a magical black box that churns out terrorists the way Detroit used to turn out automobiles. 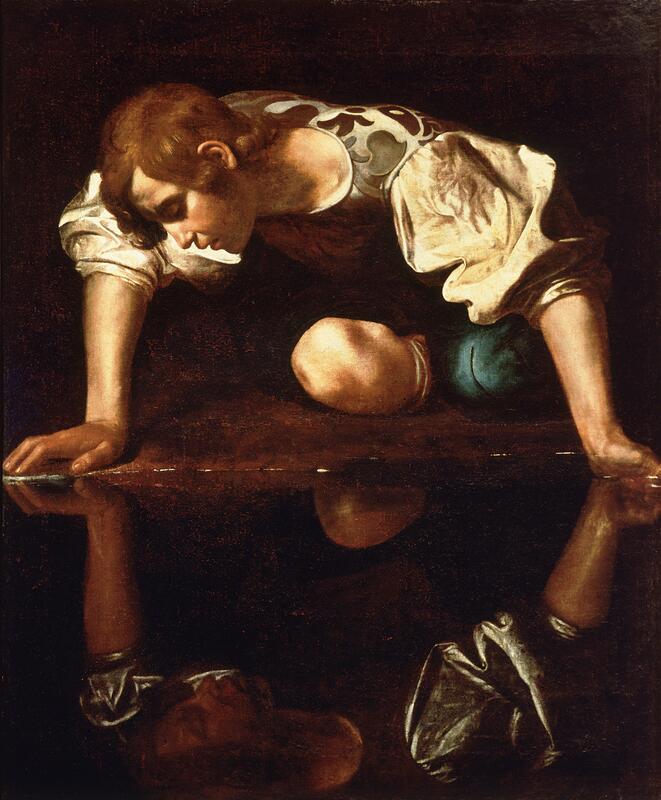 Caravaggio’s Narcissus (1594-96) , May 15, 2011. (Masur via Wikipedia). In public domain. Of course, there are tremendous psychological and material advantages to seeing other humans as “unknowns” and “others.” This week of #AltonSterling, #PhiladoCastile, and #Dallas has been proof positive of the value of some lives versus “unknown others.” The truth is, no Homo sapiens live in black holes. Unless those with the power to cut off empathy to their psychological and material advantage make a mental home for us there.  Black square, or Black is the new Black, June 2014. (http://kennyali.com/). Why we ever give voice to the vapid and vain I still don’t fully understand. In the past week, we’ve allowed Raven-Symoné (of The Cosby Show and That’s So Raven fame) and Bill Maher (host of HBO’s Real Time with Bill Maher and a mediocre stand-up political comedian) to determine our discourse on race, racism, Islam, atheism and terrorism. 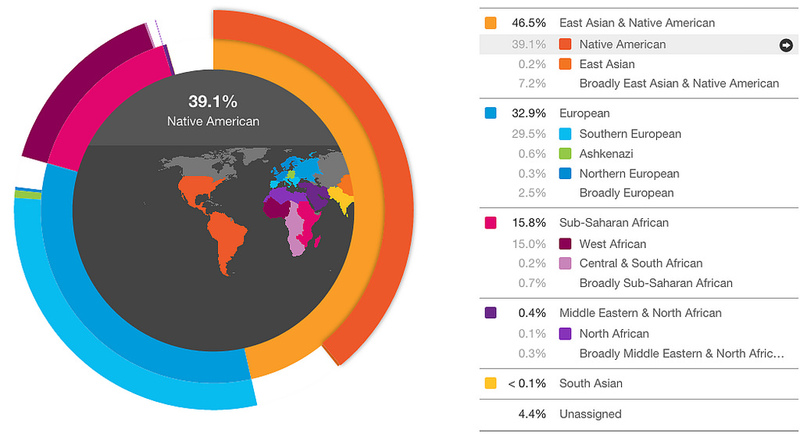 Proving once again the power of Whiteness in our racially narcissistic nation. Raven-Symoné certainly isn’t the first Black celebrity or entertainer to declare herself “not African-American” or Black, to Oprah or to the rest of the world. Morgan Freeman’s been making statements rejecting labels like “Black actor,” the term “African American,” and even Black History Month, going as far back as interviews in support of Glory (1989) and Shawshank Redemption (1994) (of course, he also was making the point that he’s an American first). Raven-Symoné isn’t even the first Black entertainer to say they’re “not Black” or “not African American” in 2014. Pharrell Williams holds this distinction, as he allegedly represents the “New Black,” whatever colorblind racist nonsense this is. 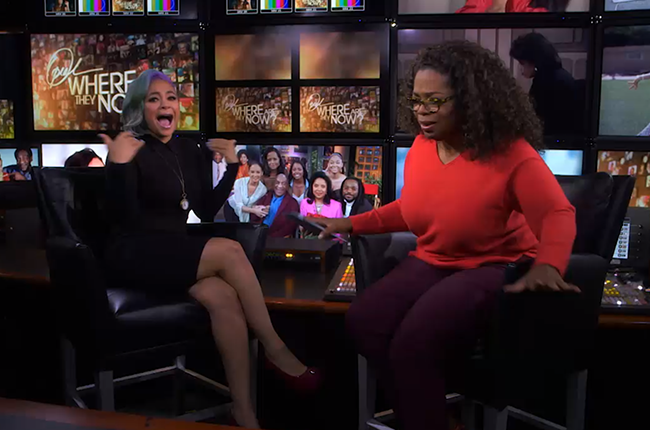 Raven-Symoné on Oprah’s Where Are They Now, October 5, 2014. (http://www.billboard.com). 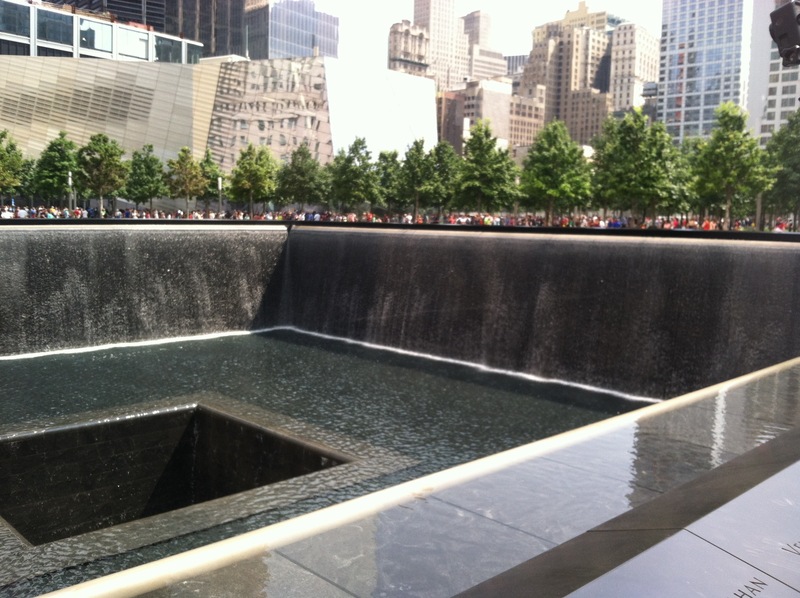 Qualifies as fair use – picture directly related to subject matter, and of low resolution. It all points to a phenomenon I’ve been calling the “unspecial American” over the past twelve years. The idea that we can discard labels, histories and cultures in an effort to make ourselves unique or special individuals. 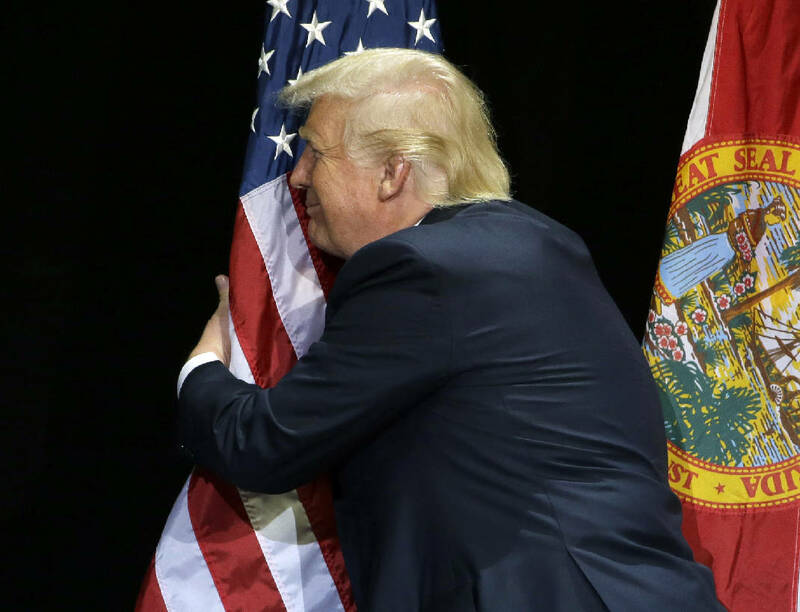 All of this is born out of a racial narcissism, one which afflicts the most vulnerable to this psychosis — the famous and the wannabe famous. Maybe there’s a bit of internalized racism to this, too — that’s clearly speculation to be sure. But that obsession to be unique, to declare oneself above constructs and labels, but then to latch on to the term “American” as if the world might forget? It reflects on some level stereotype threat, not to mention the defensive posture of someone like Raven-Symoné attempting to preserve their income and elite social status. Maher’s take on religion, especially Islam, isn’t unique. The idea that he can claim this his Islamophobia has nothing to do with race — his own Whiteness/Jewishness or that of his brown-skinned Semitic cousins — is what makes Maher’s xenophobic argument a specious one. Maher’s is a culture of violence argument, one that attempts to combine the foundational tenets of Islam with the actions of terroristic jihadists in a sweeping indictment of at least half a billion people. HBO and Maher’s friends and fans have let him get away with this ridiculous line of thinly veiled racism and Islamophobia for years. Yet if Maher made the same kind of argument about Blacks, poverty and crime — the culture of poverty hypothesis proposed by the likes of the late Daniel Patrick Moynihan in the 1960s — he’d probably lose his show. 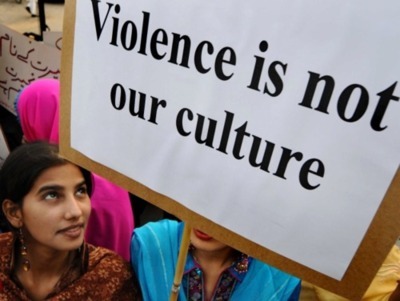 “Violence is not our culture,” 2011. 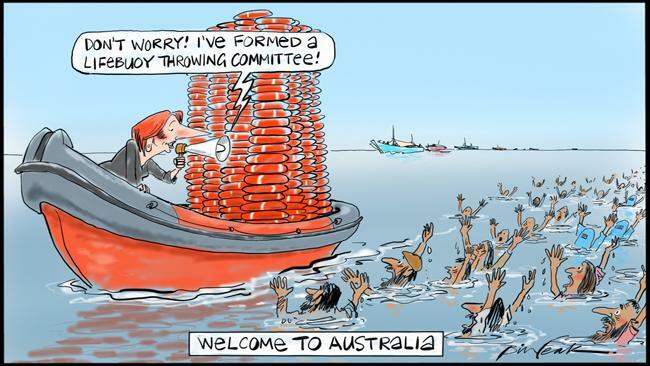 (Wendy Harcourt via http://http://www.ips.org/). That Maher has no sense of history or understanding of human nature isn’t surprising. He’s a stinking comedian, not a historian, political scientist, religious studies professor or philosopher. At this stage of his career, I’d make a better stand-up comic than Maher would a critic of any culture or religion. That Maher has found himself in arguments with Ben Affleck and Reza Aslan is telling. Maher in his late-fifties has become Ronald Reagan — an arrogant White male who firmly believes in the primacy of his brand of White culture above all others. Both Maher and Raven-Symoné should take a long look at history and learn from it. Raven-Symoné should learn that Black celebrities who deny the existence of racial constructs tend to crash into a few barriers during their lifelong journeys. Maher should look at violent examples of atheism — the French Revolution, the Spanish Civil War, Stalinism, among others — and ask if these were the product of narcissism and violent repression or the product of a culture of violence based too heavily on the reliance on the scientific method for ultimate truths. And we should continue to ask ourselves why we ever take people like Raven-Symoné and Maher seriously at all.